The Labour Party is about find out who their new leader is, after a four month contest. The winner is being announced at a conference in Manchester. David and Ed Miliband, Ed Balls, Andy Burnham and Diane Abbott are in the running to replace Gordon Brown, who quit after Labour lost the election. Most observers believe it is too close to call between the Miliband brothers, with second and third preferences likely to prove decisive. Gordon Brown, the man whose resignation in May, following Labour's election defeat, triggered the four month contest, made a short speech to delegates ahead of the leadership announcement. Mr Brown, who appeared on the platform with wife Sarah, received a standing ovation from delegates. He paid fulsome tribute to Labour activists, past leaders, including Tony Blair, and his family, and said the party should be "proud" of all it achieved in power, hailing its "ideals of fairness and justice". "You, the members of the Labour Party changed our country forever, and for the better," he told delegates, who have packed into the hall to hear the leadership announcement. He said he wanted to "take full responsibility for what happened at the election" but urged an end to the "blame game" and said the party had to look to the future. He said he would give his "full support" to whoever won the leadership contest, who would not just be the Labour leader but "the next prime minister of our country". Acting leader Harriet Harman also addressed delegates, telling them of the "great" challenges Labour faced in oppositon, but stressing that the party was "strong," with a surge in new members and rising poll ratings. She said Labour had been "strengthened" by the leadership contest and paid tribute to the leadership contenders, who had been "a credit to our party". Ed Miliband was installed as favourite to win the leadership contest by some bookmakers for the first time on Friday. 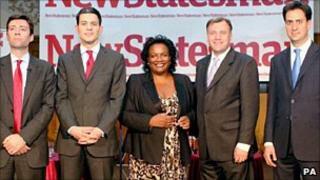 Ed Balls, Andy Burnham and Diane Abbott are thought to be battling it out for third place. As he left his London home to travel to Manchester for the declaration, David Miliband said speculation that his brother had won should be taken with "a very large skip of salt". But he also insisted he could work under Ed's leadership, joking that they would enjoy "more than a pint" whatever the result. Mr Miliband said he was glad their "poor mum" had got through the ordeal of the brothers taking each other on for the leadership. "Well, I think that she's survived so that's good - as we all have," he said. Arriving at the conference centre in Manchester, a relaxed and confident-looking Mr Miliband, said he was looking forward to the "final score," adding: "You only think about winning at this stage. You don't think about the other options." He was followed into the conference centre a few minutes later by brother Ed, who was in a more terse mood, saying: "I am confident of my campaign but nobody knows the result." Diane Abbott, arriving for the announcement, said she was feeling "nervous", adding: "May the best person win." Former Labour leader Neil Kinnock, who is backing Ed Miliband, told the BBC: "Both of the [Miliband] candidates are very, very bright. Both have total commitment. "The thing that marks out Ed is an astonishing level of energy and inventiveness and also the fact that he is comfortable with people from all backgrounds and all statuses, which I believe to be an absolutely fundamental requirement for the leader of the Labour Party, the potential prime minister." Labour MP Douglas Alexander, co-chairman of David Miliband's campaign, said his man was still the favourite, but the party would unite behind whoever wins. "The Labour Party normally forms a circular firing squad after we lose a general election," he said. "One of the most heartening aspects is not just the civility of this campaign, but also that during it 32,000 more people have chosen to join the Labour Party." MPs and MEPs, party members and members of trade unions and allied organisations took part in the vote. Each of the three components counts for a third of the overall result, but with those taking part casting second, third and fourth preference ballots, it is difficult to predict the outcome. Meanwhile, Andy Burnham has called for a change in the rules for future leadership contests, with tighter spending limits and a switch to one member one vote instead of separate sections for MPs, trade unionists and party members. "I don't see why my vote as an MP is worth 600 times the vote of an ordinary party member. That's not how we build a mass membership party," he told The Guardian. Harriet Harman will return to her job as the party's deputy leader once the result is announced - she has been acting leader since Mr Brown stepped down as party leader and prime minister in May. Four of the five candidates are former cabinet ministers - Mr Balls, a close ally of former PM Mr Brown, was schools secretary, Mr Burnham was health secretary and Ed Miliband was the energy and climate change secretary. Left-wing backbencher Miss Abbott was a late entry to the race who got onto the ballot paper only with the support of David Miliband. But she has used her history as a critic of the Iraq war and other decisions taken by the previous Labour government to differentiate herself from the other candidates. About three million people are expected to have voted in the contest. Ballot papers are being verified and counted by the independent Electoral Reform Services. The day after the winner is announced nominations open for the shadow cabinet, with Labour MPs voting to decide who should have a place. Shadow cabinet candidates have until next Wednesday to put their names into the ring, with about 50 already in the running for the 19 slots up for grabs. The other members of the shadow cabinet - party leader, deputy leader, chairman of the Parliamentary Labour and the chief whip - are voted in separately.